Have I got a delicious and unique sundae for you! 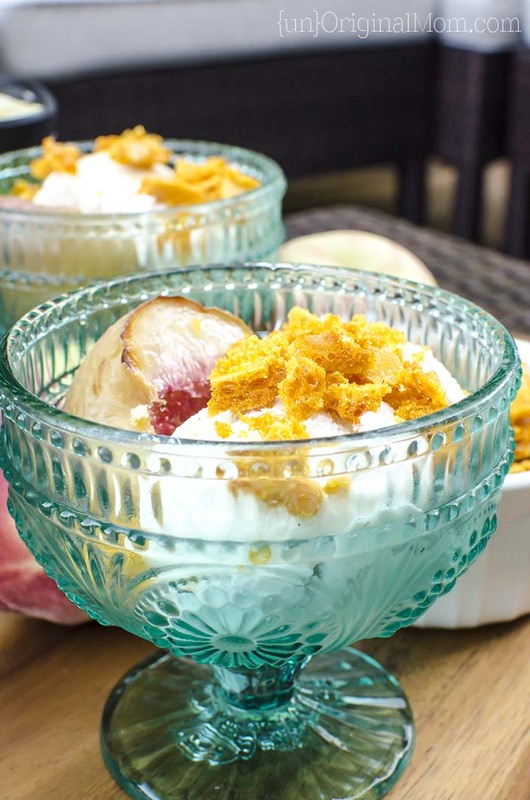 This incredible sundae with roasted white peaches, honeycomb, and vanilla ice cream captures some of nature’s best flavors in a perfect summer dessert. 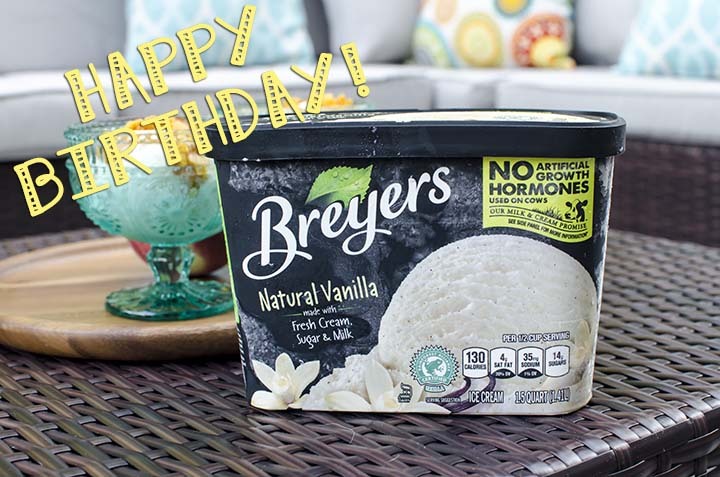 Happy birthday to you, happy birthday to you, happy birthday dear Breyers, happy birthday to you!! Did you know that Breyers is celebrating their 150th birthday this year? I know! I didn’t even know ice cream was that old. (Kidding. Kind of.) But Breyers has been around for quite a while, doing what they do best – making amazing ice cream. Here’s a good “did you know” fact: Breyers was founded in Philadelphia (yay PA!) in 1866 when William A. Breyer hand-cranked his first gallon of ice cream, which featured fresh fruits and nuts, and sold it to his neighbors. I wish I lived next to Mr. Breyer! In celebration of Breyers’ 150th birthday, Chef Curtis Stone and his wife, Lindsay Price Stone, have created 12 fun, family-friendly recipes featuring Natural Vanilla. Curtis and Lindsay drew inspiration from each month of the year as well as seasonal ingredients for the recipes, to give families a way to celebrate birthdays and special occasions with Breyers all year long. 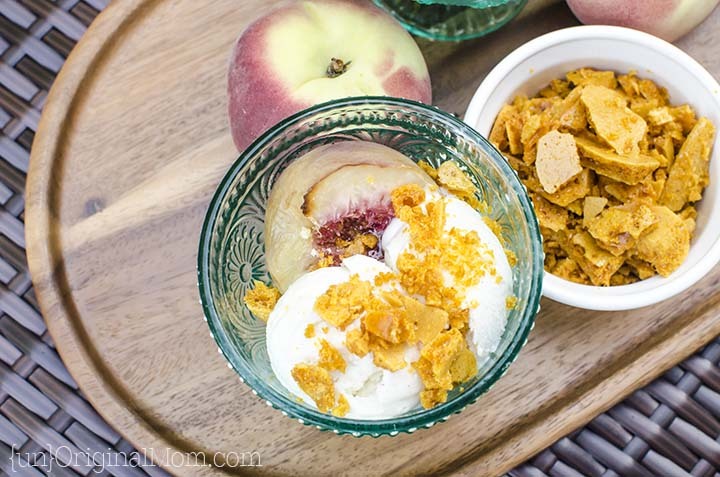 Breyers asked me to try out this recipe for Roasted White Peaches with Honeycomb and Vanilla Ice Cream…I didn’t have to think long about that one. Yes, please! 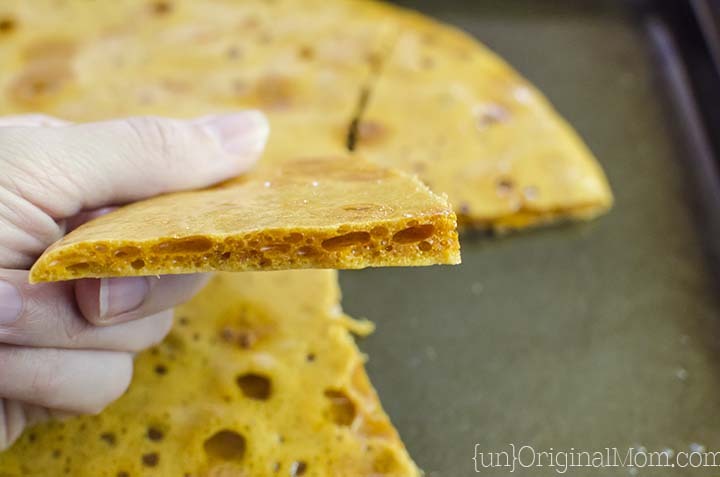 Have you ever had honeycomb candy? 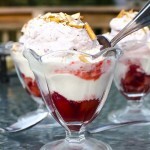 I hadn’t, and I was surprised at how simple it was to make and how absolutely delicious it is as an ice cream topping. Basically you boil sugar, honey, and a little bit of water together for about 5 minutes (until it reaches the hard crack stage, or 305 degrees). Then you remove it from the heat and add some baking soda. It’s like a science experiment…it bubbles up and gets all frothy! (Your kids will love that part!) Then you pour it out onto a greased cookie sheet and let it cool for about 30 minutes. When you come back to it, it’s completely hardened and you can just break it apart, so it looks like this. And it tastes delicious! I pounded mine up with meat pounder and stored it in an airtight container until I was ready to make the sundaes. 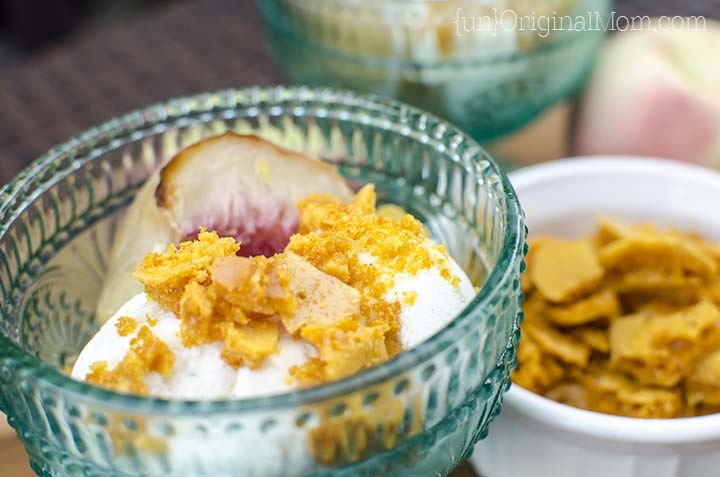 The other key ingredient to this sundae (besides the ice cream, of course) is roasted white peaches. Pick up a few ripe ones from the Farmer’s Market. 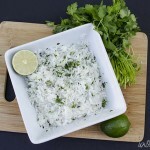 All you have to do is slice them in half, put them in a baking pan with some water, and sprinkle with lemon-zested-sugar. Roast in the oven for about a half hour. Then the magic happens. 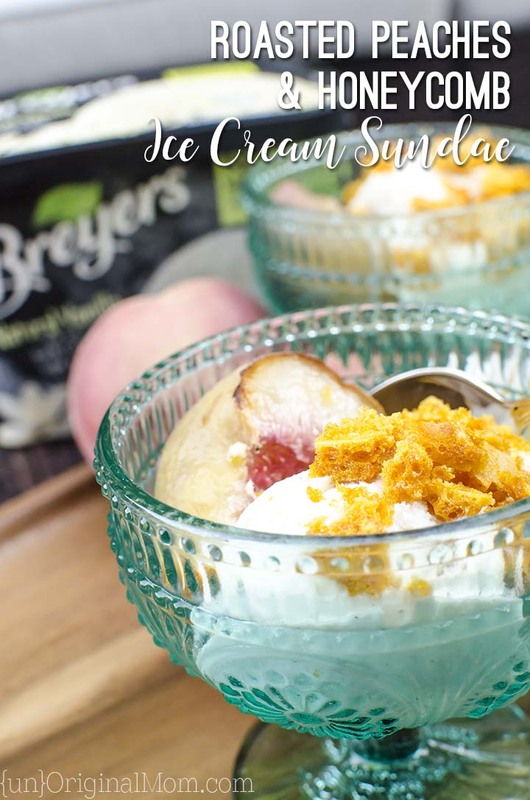 Put together your sundae with a half of a roasted peach, Breyers Natural Vanilla ice cream, and a generous sprinkle of your honeycomb candy pieces. *Almost* too pretty to eat, don’t you think? 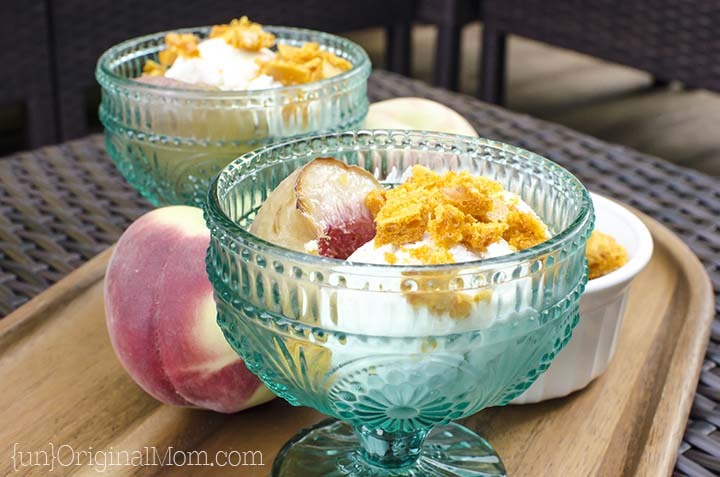 The warm peaches with the vanilla ice cream is an amazing combination, but that crunchy honey flavored candy just completely makes the dish. 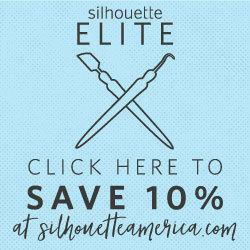 How impressive would these be to serve to some dinner guests? 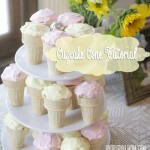 Or just make them for a quiet evening at home with the family. In any case, you can feel good about serving this up to your friends and family with Breyers Natural Vanilla ice cream, because all Breyers vanilla is real and from sustainably farmed, Rainforest Alliance Certified™ vanilla beans. Plus, Breyers only sources milk and cream from cows not treated with artificial growth hormones. 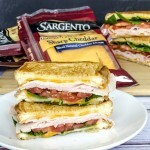 * Follow Breyers on Pinterest, Twitter, or Facebook for more yummy recipe ideas! In a small bowl, whisk 3 tbs. sugar and lemon zest for about 1 minute, or until sugar is fragrant and moist. 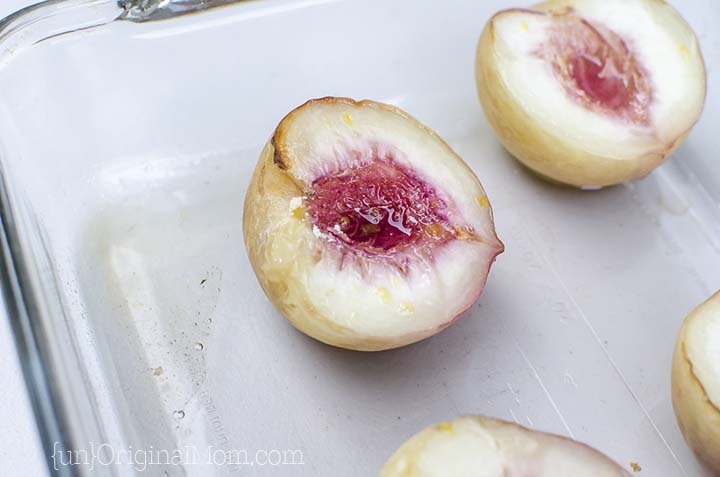 Arrange peaches, cut side up, in a 13x9-inch baking dish. Pour ⅔ cup water into dish. Sprinkle lemon sugar mixture over peaches and roast for 25 to 30 minutes, or until peaches are slightly softened and have released their juices. Spoon ½ cup Breyers® Natural Vanilla Ice Cream into each of 8 bowls. Top with warm roasted peaches and warm juices. 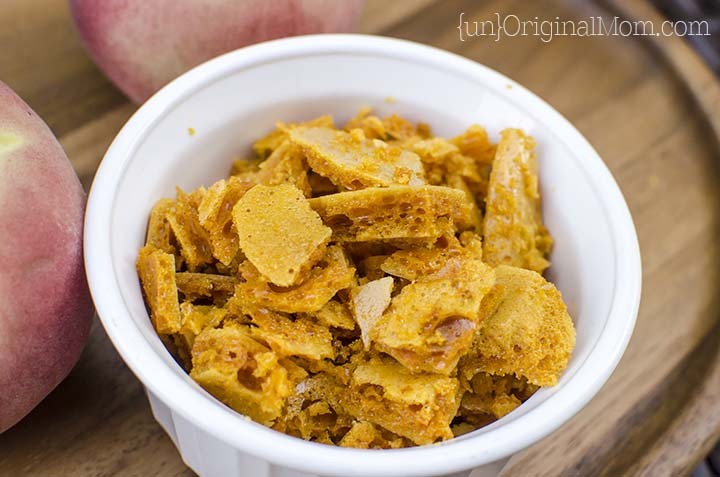 Sprinkle with honeycomb pieces and serve immediately. Hurry up and grab some peaches while they’re in season to try out this recipe – you won’t be disappointed!